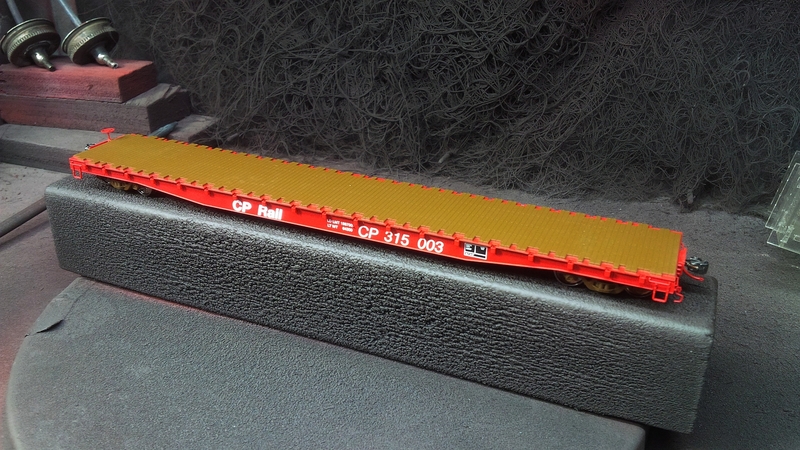 CP 315122 is a Wheels Of Time flatcar model with new decals added to represent an early ’70s CP Rail repaint, identified by the black capacity data lettering. The ACI label and 2-panel COTS stencil also set the era. 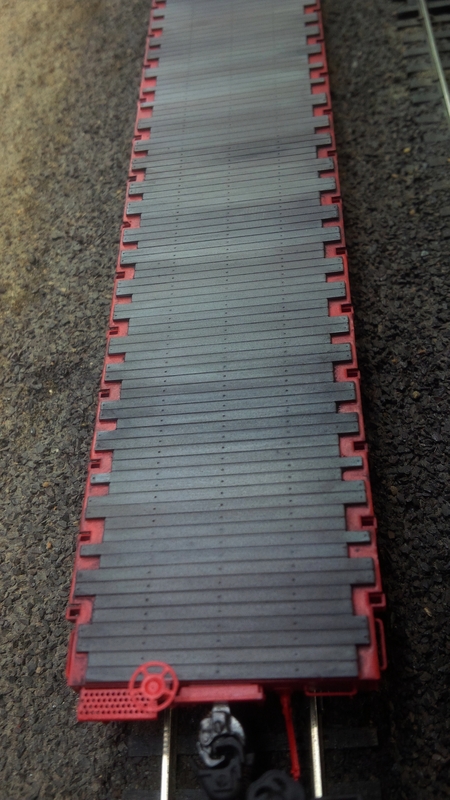 Flatcars are probably the most under-appreciated pieces of rolling stock in the world of railway modelling. Due to their being, well, ‘flat’, they appear very simple and lack the visual impact of a boxcar or covered hopper. But they are actually among the most specialized cars around, possibly second only to tank cars. This under-appreciation is likely why we still need more flatcar variety in model production. Fortunately the various manufactures are helping and have released a number of great new models over the past few years; the ExactRail 53ft GSC, Tangent 60ft GSC and Intermountain 70ton AAR cars just to name three. Now we can add Wheels of Time to this list with their arrival on the HO scene. The company is not new; they’ve been producing fine quality N-gauge products for a number of years now. However they recently branched into HO scale with a 70ton Gunderson flatcar in both standard and bulkhead versions. These Wheel of Time flatcars are excellent models. They come with metal grab irons, coupler lift bars, air hoses and #58 Kadee couplers housed in scale draft gear (nice touch). Additionally they come with ASF ride-control trucks equipped with free-rolling metal wheel sets. This model is a boon for modern modellers (‘70s to present) in general, and a pretty big deal for us on the CP Rail Sudbury Division. 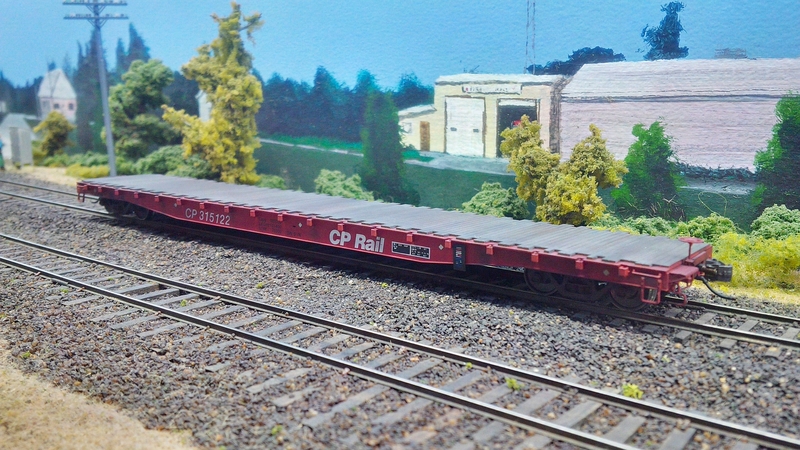 Though it is a US prototype car and CP never purchased any Gunderson flats, the model does bear a very strong resemblance to the Napanee Industries 61ft flatcar. CP purchased 135 of these cars from Napanee Industries in 1967, numbered CP 315000-315134. All were delivered in the then current black scheme utilizing a larger font for the reporting marks and road name. However, somewhat surprisingly, close to half the fleet was repainted into CP Rail Action Red by the mid ‘80s, allowing modellers more paint variety. The fleet is still in service today with only a few cars retired, though delivery-black cars are few and far between. The dimensions and details of the WOT model are very close to the Napanee car. The overall length of the model measures one (1) scale foot longer than the prototype, which comes to a little over 3 real millimeters. This a minor discrepancy; for more importantly the deck style, fishbelly profile and the flange running along the bottom of the car all match up well against the prototype. For the rivet-counters among us, the more serious inaccuracies between the two are in the stake pockets. To begin, there are 18 side pockets on the Napanee car versus 19 on the Gunderson / WOT model. I personally consider this a minor issue, because with that many of them who really has the time to stop and count during an operating session? The more significant difference is the Napanee car has 8 end-pockets (4 per end) where as the Gunderson / WOT model has none. This is not easy to spot as most photographers shoot these cars trackside, but from any elevated photo you can see these end-pockets. One simple way to simulate these would be to use decals. These pockets appear as little more than small black squares on the deck, and unless you stare down at one on a 90 degree angle, a decal would be a clever way to represent these. Regardless of the inaccuracies, this is a most welcome car for CP modellers. As new accurate rolling stock models keep being released for Canadian modellers, flatcars were a glaring omission. Hopefully this model is a beginning towards rectifying the situation. This is an unmodified model straight from the box. A few extra decals, weathering, and most especially a repainted deck will make this car really stand out. Though out of the box these cars look great, with some work you can transform these into stand out models. One can begin by adding additional decals, as I find the models a bit Spartan lettering-wise. That, and our club models the ‘70s decade, so adding ACI labels and appropriate era COTS stencils are musts. Extra lettering helps, but the biggest improvements comes from re-painting the deck and weathering the car. Wheels of Time painted their decks a greenish brown colour, whereas the lumber weathers to gray on any prototype car I’ve seen. This deck is molded in place, so replacing with laser-cut lumber is not an option. 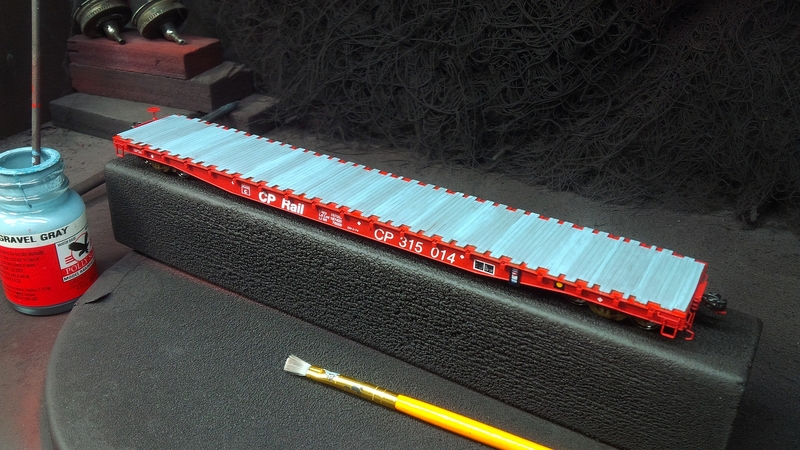 CP 315014 is a factory lettered car with extra decals added. The deck has been hand painted with PollyScale ‘New Gravel Gray’ before weathering is applied. I begin by hand painting the deck with PollyScale ‘New Gravel Gray’, though any light gray will do. Paint evenly brushing from side-to-side, and continue from one end of the car to the other. If you brush lightly and carefully, you can avoid getting paint on the metal ends of the deck. 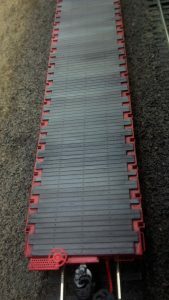 If you accidentally do, thanks to the deck being raised it’s easy enough to touch these up with Action Red afterwards. Testors has discontinued PollyScale brand paints recently, which is unfortunate as it was almost as wonderful for brush painting as it was for airbrushing. Without thinning and despite taking any extra care, the paint dries flat with no brush strokes. 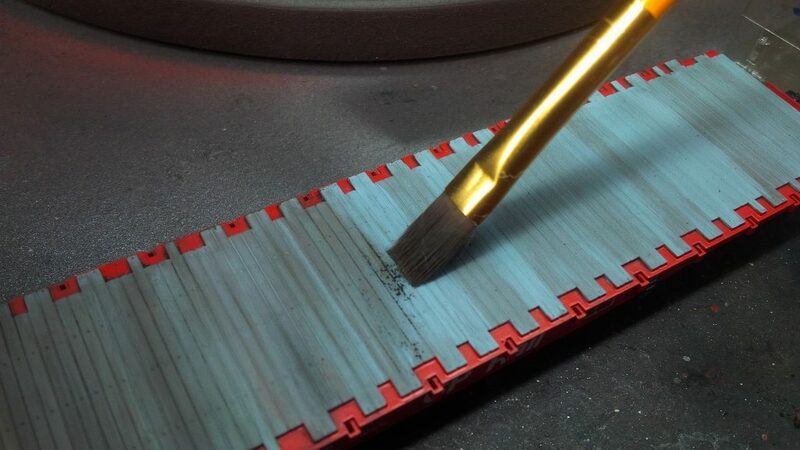 In this case, brush strokes could actually help give the deck a wood grain look. Regardless, with PollyScale’s demise, I recommend any decent acrylic paint for this. 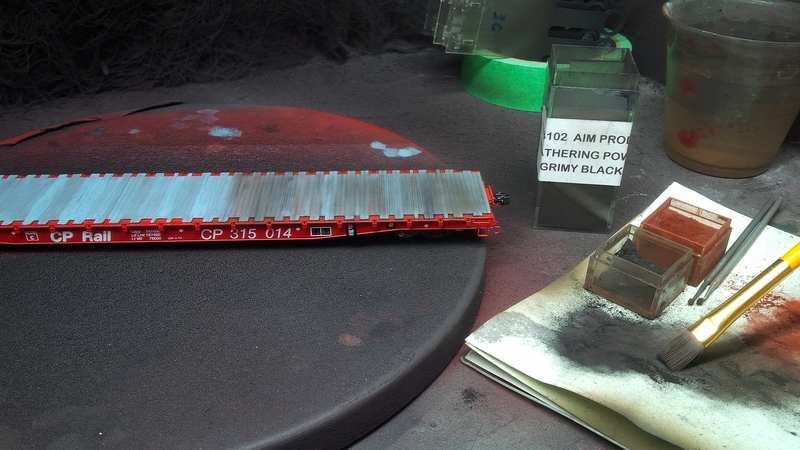 Deck weathering on CP 315014 has begun utilizing AIM weathering powders. After painting, I go over the deck with AIM weathering powders using three colours; grimy black, dark earth, and dark rust. Vary the powders board by board and have fun mixing. You end up with a very convincing deck in no time, and the powders really help the details stand out. The convenience of weathering powders is you can wash them off with water if you don’t like the result, and then try again. Mixing different coloured powders adds realism towards achieving the weathered lumber look. I finish by weathering the body of the car itself, again mainly with the powders. Here one can use rust colours running down the car to mimic oxidization, and extra dirt where it naturally collects around the trucks. I highly recommend studying real flatcar photos to replicate these patterns. Next I airbrush some grime on the underbody of the car, and most importantly spray the trucks in order to weather them. The best weathering jobs are thoroughly unconvincing if the trucks are left Delrin-plastic black with shiny metal wheels. Finally I airbrush the entire car with a clear flat coat in order to protect the weathering and extra decals. Weathering the deck really brings out the detail. Click to enlarge. The first few finished Napanee flatcars have entered revenue service on the WRMRC layout; hauling steel slabs, gas pipelines, farm equipment and numerous other lading across the Sudbury Division. Future additions will see some of these models repainted into the basic black delivery scheme. We wish Wheels Of Time great success with this car, and we thank them for helping out Canadian modellers.